Did someone say Hush Puppies?!! Be still my heart! How I do love those Hush Puppies! And if you’re contemplating making up a big batch of that delicious Carolina Pulled Pork I just told you about for your Independence Day celebrations, these Hush Puppies would be fantastic served right alongside those tasty little sliders. 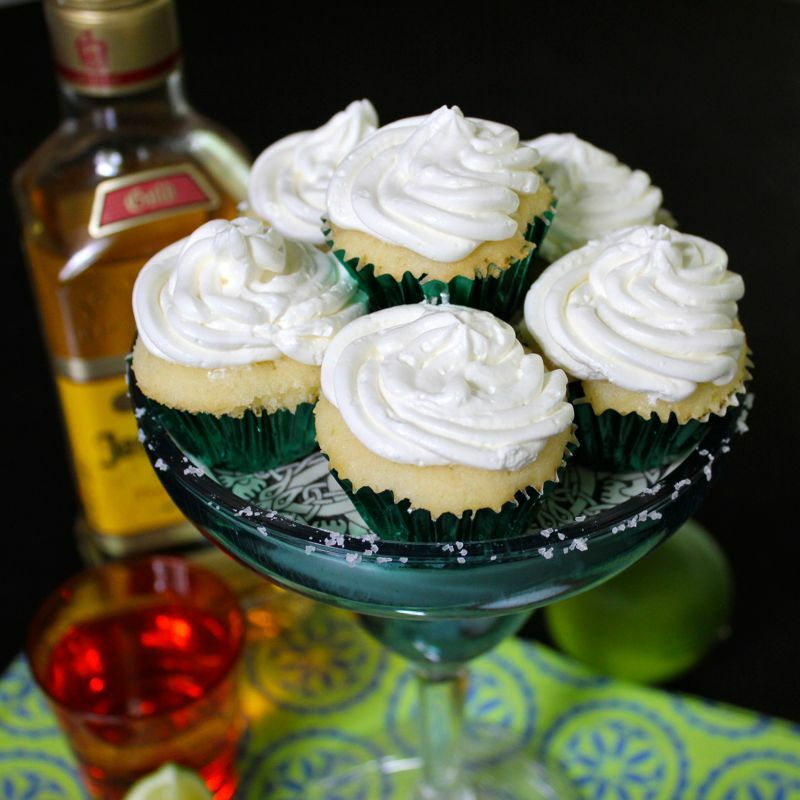 Your party will be the talk of the town! 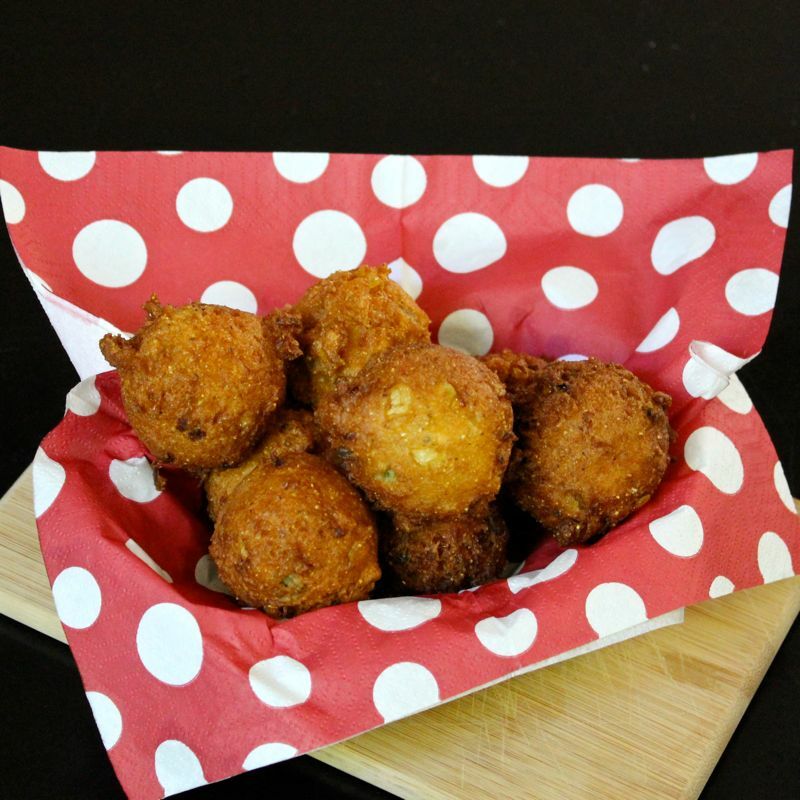 For you folks out there who might not know what a Hush Puppy is, (and I’m not sure where in the world you’ve been hanging out…) a Hush Puppy is basically a ball of cornmeal batter which has been deep-fried. They are often served along side fried seafood dishes or with barbecued foods. Now there are numerous legends about how they got their name. They seem to all involve some group of folks, be they Southern hunters, fisherman, civil war soldiers or cooks, taking a cornmeal mixture which they had been using as battering for whatever food they were cooking, deep-frying it and giving to their barking dogs to get them to quiet down while uttering “Hush Puppy!” as they tossed the tasty little morsels over to them. It actually works too. You will see the truth of it when you serve up a big basket of them at your house. Folks will be so busy chowing down, you won’t hear a peep out of them! 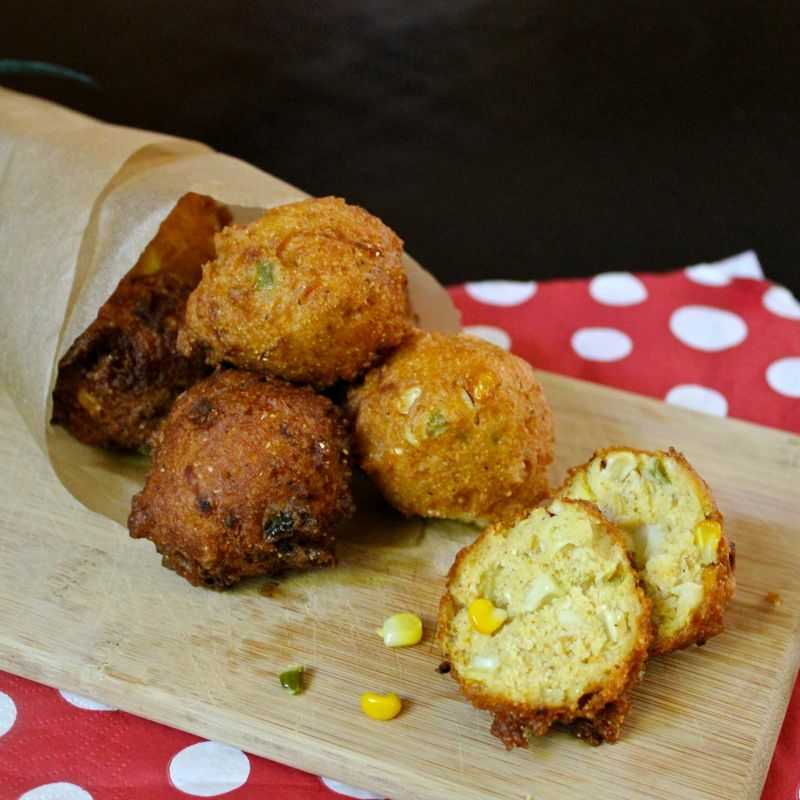 Hush Puppies are very easy to make. I will mention a couple of pointers that I think will be handy. Make sure you add enough oil to your Dutch Oven. You need to have enough to entirely cover the Hush Puppies as they fry. And take care to get that oil up to 375°F before you start frying and that it returns to that temperature between batches. If the oil is not hot enough when you fry, your puppies will be greasy. I don’t add any sugar into my batter, preferring a savoury, spicy puppy. But if you’re one of those folks that love sweet cornbread, you probably want to add some sugar into this mix. 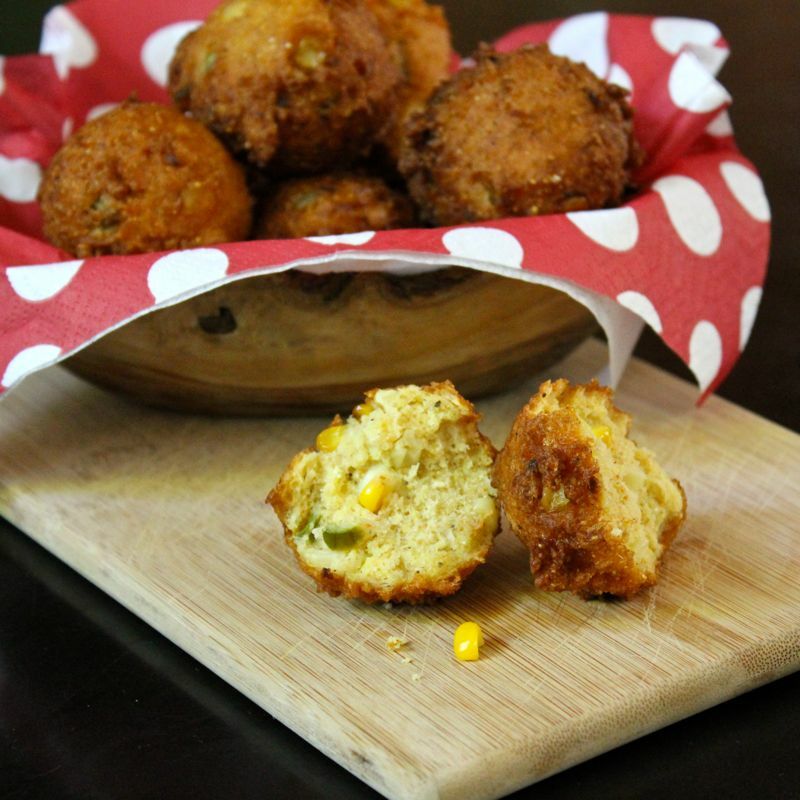 I also like to use the TexMex Grilled Corn (recipe found below) in my Hush Puppies. I think it adds a bit more kick to them. 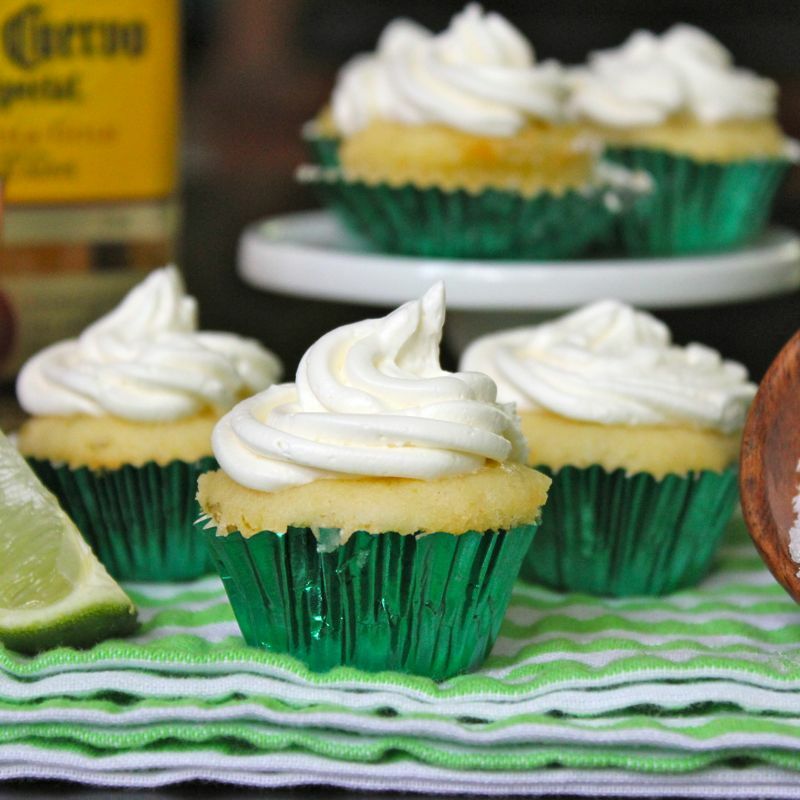 However, I have made them in the winter when I wasn’t keen to go out and grill up some corn and have found that canned corn works quite well in a pinch. Believe me, you will find that these little devils are addictive… soft and spicy on the inside with a satisfying crunchy exterior. 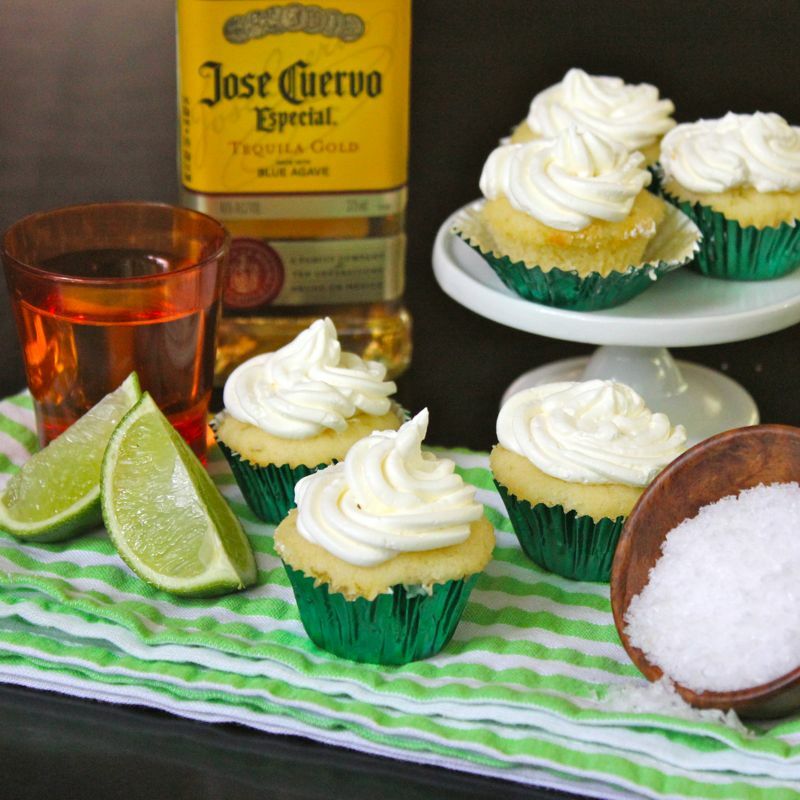 Try some today and you’ll be hooked! In a large mixing bowl, whisk together the self-rising cornmeal, self-rising flour, cayenne pepper, kosher salt, and sugar if you are using it. In a large glass measuring cup, stir together the buttermilk, egg, grated onion and bacon dripping. Make a well in the center of the dry ingredients and add the liquid ingredients to the dry. Stir together until the dry ingredients are just combined. Do not overmix. 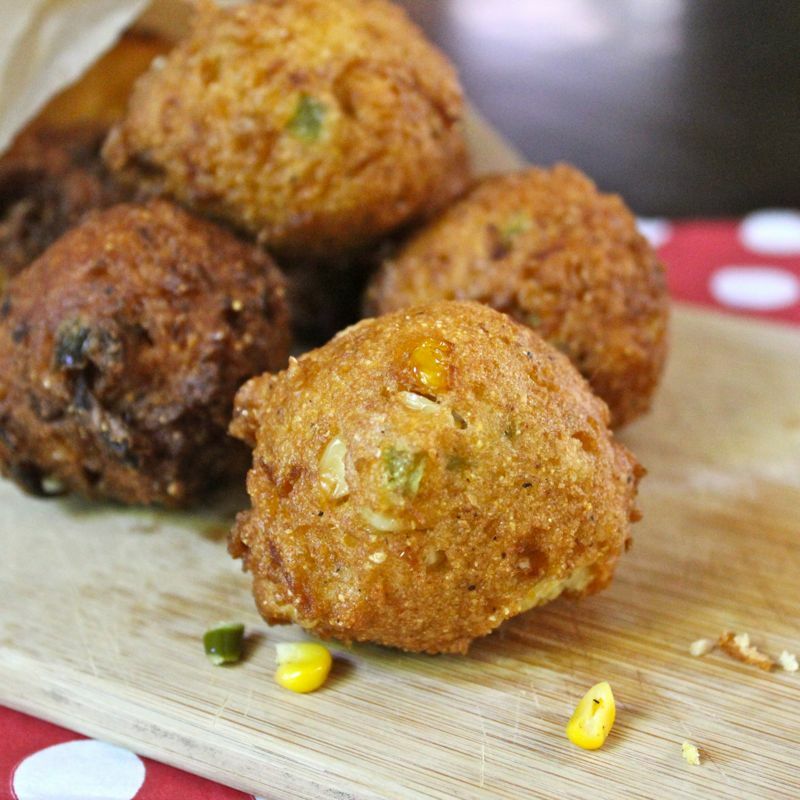 Gently fold the diced jalapeños and grilled corn into the hush puppy batter. Cover and refrigerate for about 1 hour until mixture has risen. Place a 6 qt. Dutch oven on the stove. Pour enough oil into it so that it reaches 2″ up the sides. Heat oil until it reaches a temperature of 375°F. Using a 1 tablespoon cookie scoop or two kitchen spoons, drop small rounds of batter into the oil. Do not crowd the pan. Cook, stirring occasionally and flipping halfway through, until golden on the outside and crisp, about 3 -4 minutes. Remove hush puppies from the oil and drain on paper towels. Repeat with remaining batter. Serve with tartar sauce, honey, butter, remoulade, etc. or just use them to mop up any extra barbecue sauce that might be lurking about. Your choice! 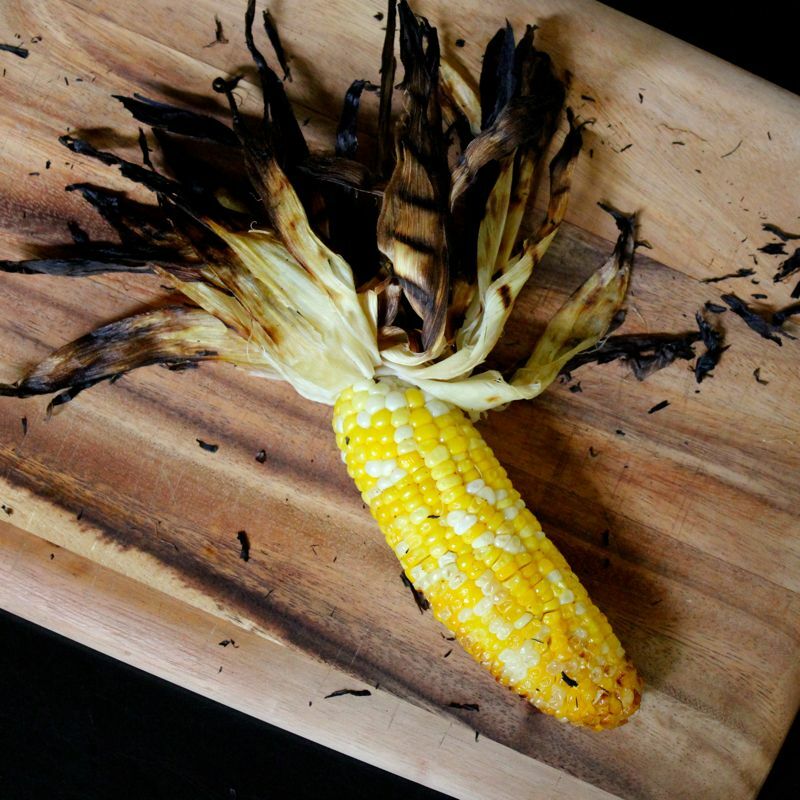 Remove the corn from grill and allow to cool a few minutes, then cut off stem end, place the flat cut end on bottom of large bowl, and use a corn zipper to strip the kernels from the cob. Or if you don’t have a zipper, run a small sharp knife down the length of the cob, slicing off kernels. Oh yes! Summer is here and folks are thinking about cookouts, picnics and all manner of backyard barbecues! Believe me, I am a big fan of simple hot dogs and burgers on the grill. But what really gets me droolin is the thought of a pulled pork sandwich. Now as much as I’d like to tell ya’ll that I was out in the backyard cookin a whole pig; alas that was not the case. 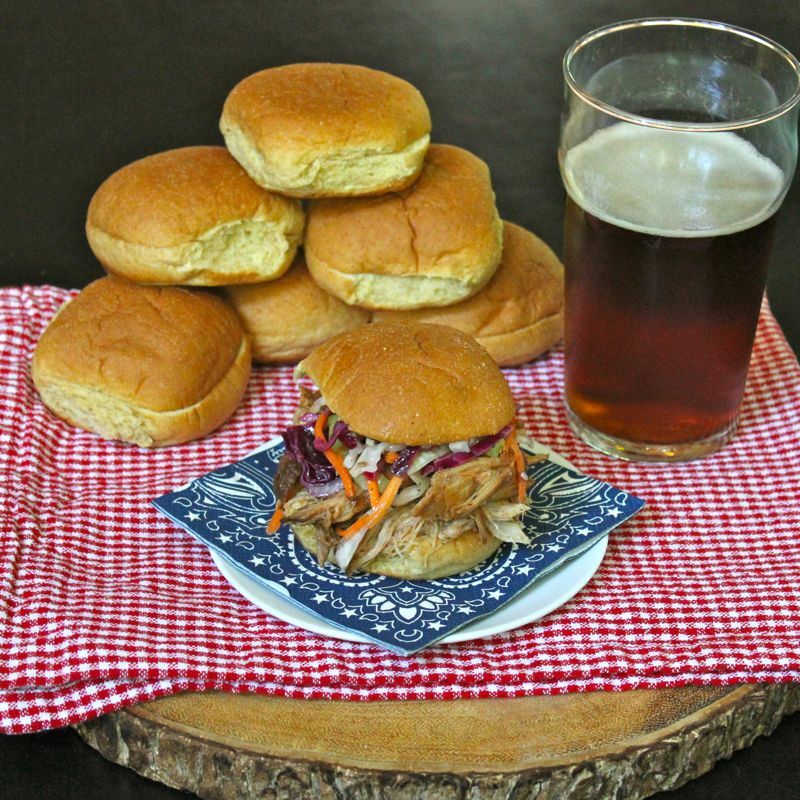 The secret here is that the melt in your mouth, delicious pulled pork found in these little sliders that you see here was cooked right in my wee kitchen in a slow cooker and required very little attention from me. There was no slaving over a pit. How great does that sound? 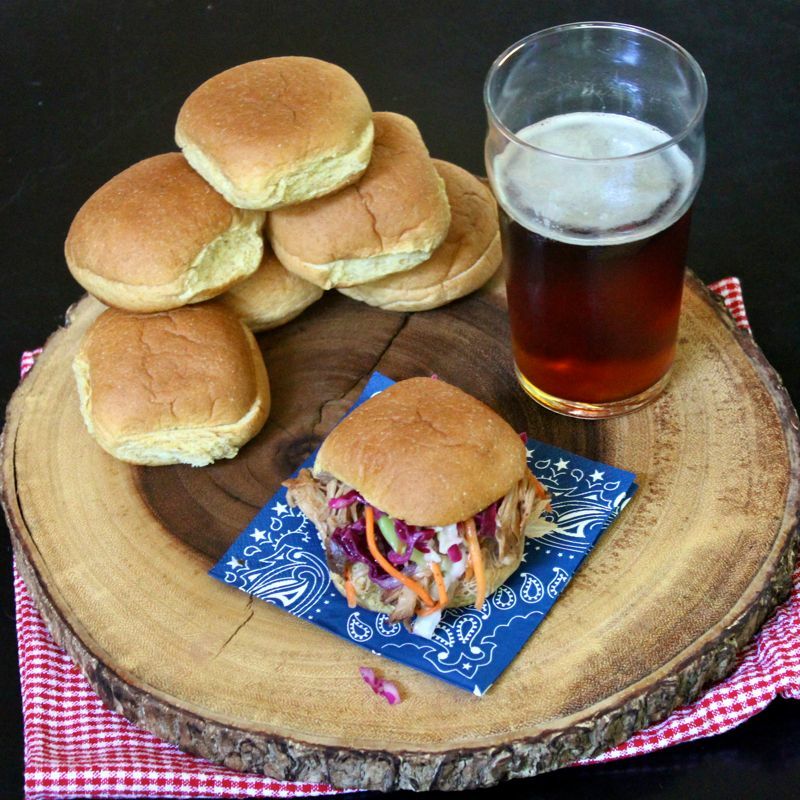 Now you might be wondering why these pulled pork sliders are “North Carolina Style”. It is all about the sauce. And there are big differences in barbecue sauces in the US depending on what region you find yourself in. I’m no expert on Barbecue sauces, but I will try my best to explain the differences as I understand them. Kansas City style sauce is the one that most folks think of when they think of barbecue sauce. I’m sure you know it well, a sweet yet slightly tart thick tomato based red sauce with a bit of smoky flavour about it. Memphis Barbecue sauce is very similar to the Kansas City style but has a bit more vinegar added in along with some molasses as a sweetener. If you are in Texas the sauce will be thinner and spicy, with the meat drippings added in along with seasonings such as cumin, chili, onion, bell pepper and just a bit of tomato. In Alabama you are likely to encounter a strange white barbecue sauce. Yup…white barbecue sauce! No tomatoes there, just a mixture of mayonnaise, vinegar and pepper. In South Carolina the folks love yellow mustard base sauces sweetened with molasses or honey. Again no tomato. And finally we get to North Carolina. North Carolina sauce is my favourite sauce. And truth be told, it varies within the state depending on how far east or west you travel. The Eastern North Carolina Sauce is a thin, nearly transparent, vinegar base sauce with lots of chili pepper flakes floating about in it.Very little to no sugar is added. It isn’t anywhere near thick enough to sit on top the meat, but rather thoroughly penetrates it. As you travel a bit farther west, you will find that the Carolinians there add just a bit of ketchup to the sauce, making it a bit sweeter and a little thicker. These particular sliders here seem to hail from a more westerly spot in the State. You might wonder why there are two sauces called for in this recipe. The first sauce is to give that pork some lovely flavour while it is cooking. However, as I’m sure you know, pork can release a lot of grease when cooking. Rather than try to skim off and separate the fat, it is best to just get rid of that first sauce. Once the pork is nearly done, shred it and then return it to the slow cooker with the second nice fresh sauce to finish cooking. 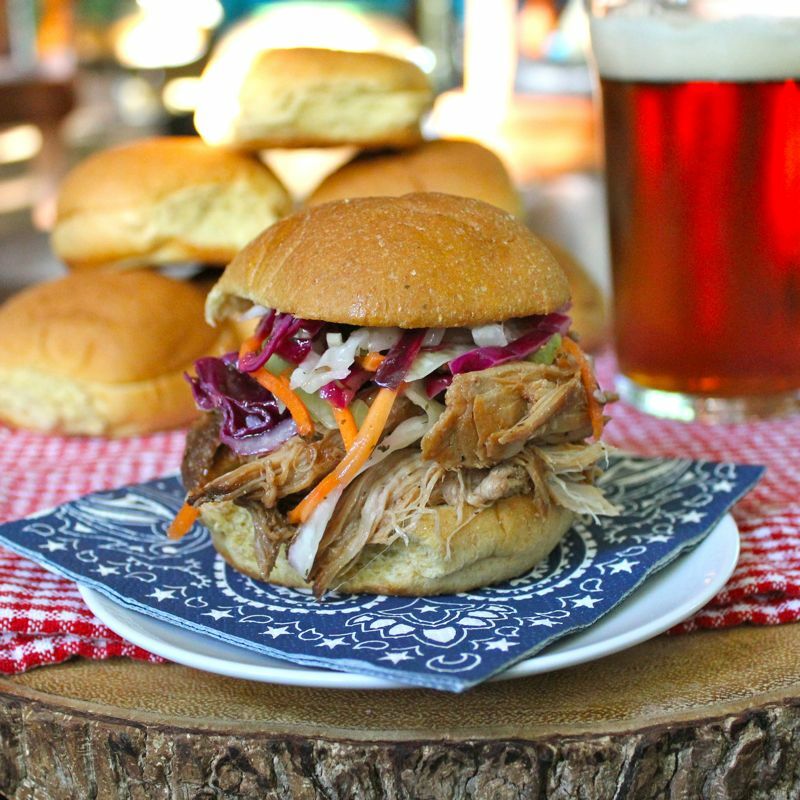 As far as the coleslaw goes, I just can’t imagine eating a pulled pork sandwich without it, especially if it is a tangy, spicy Carolina pulled pork. The sweetness of the coleslaw really complements the tart flavour of the pork and adds a nice crunchy texture. However, I’m told some folks think slaw on pulled pork is heresy. Hmmm…to slaw or not to slaw…that is the question. The answer? To each his own I suppose. I say serve that coleslaw on the side so folks can indulge or abstain as they wish. 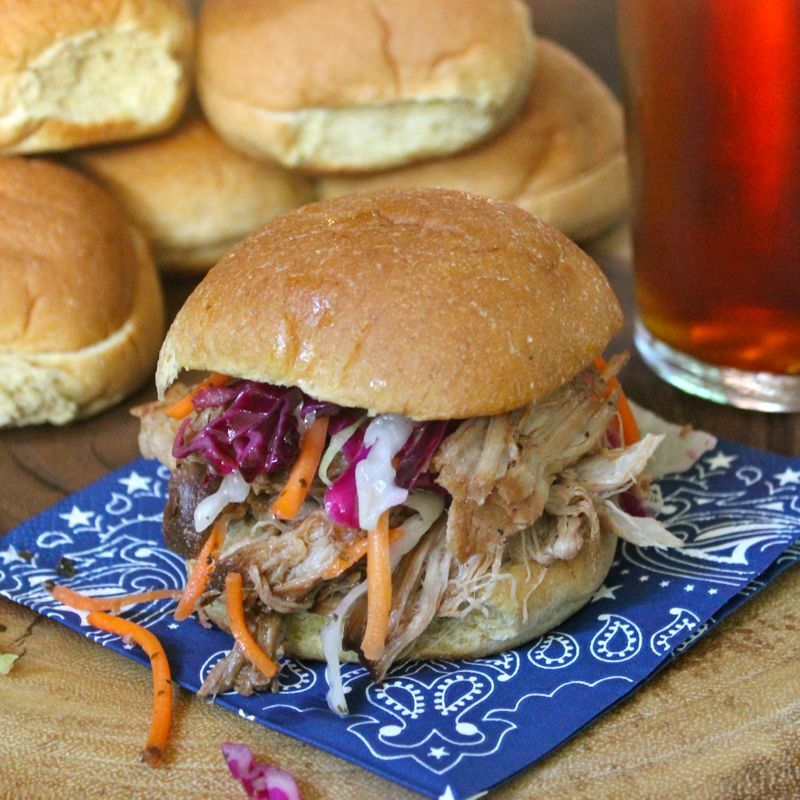 Bottom line is you’ve just got to make up a batch of these North Carolina Style Pulled Pork Sliders for your next gathering. (The 4th of July will be here before we know it..) Trust me…folks will go hog-wild! Place onion slices in the bottom of your slow cooker. Place pork roast on top of onions. Whisk together ingredients for first sauce. Pour first sauce over roast. Cover and cook on low 8 hours or on high 4 hours. Whisk together all ingredients for second sauce. 30 minutes before serving, remove pork from slow cooker and shred with two forks. Drain juices and onions from slow cooker. Return shredded pork to slow cooker. Pour second sauce over pork and stir to combine. Cover and cook 30 minutes longer. 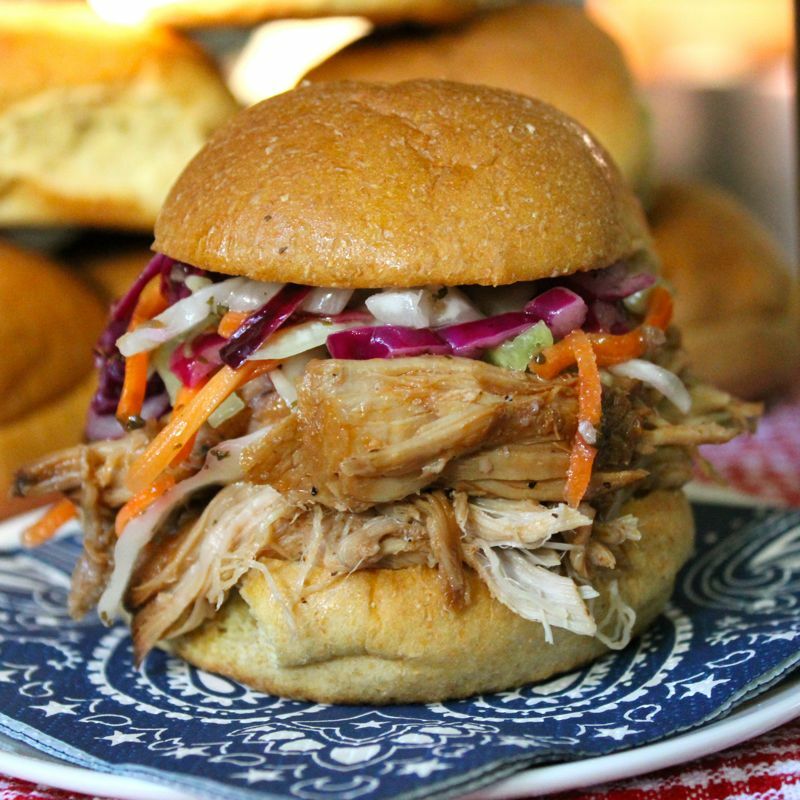 To serve place pulled pork on bun and top with slaw. You are currently browsing the Lea & Jay blog archives for June, 2014.